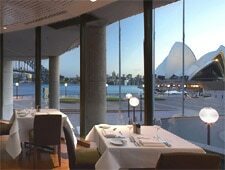 ARIA offers panoramic views of Sydney’s bridge, opera house, the harbor and busy Circular Quay. : Come for lunch when the bustling harbor and quay is at its best, or dine at night when the Sydney Opera House glows white against the lights of vessels on the water. If your schedule includes a show at the Opera House, it’s only a short stroll across the Forecourt to a pre-theatre or supper set-menu at ARIA. But it’s not all about the views. The real magic happens on the plates and this is what has kept diners returning to this key player in Sydney’s dining scene for more than 15 years. It’s inevitable that celeb-spotting comes as an added bonus. High-profile chef Matt Moran, business partner Bruce Solomon, and the highly skilled team of chefs ensure that no detail is missed. Lamb is carefully reared on Moran’s family farm and served with foraged greens and vegetables. Fine local seafood often features in entrées, and for dessert, a must-try is a mango and passion fruit soufflé, served in a copper pot. Moran’s specially designed Kitchen Table overlooking the chefs at work allows him to discuss the eight-course tasting menu with up to eight lucky diners. Great dishes need good wines, and ARIA’s globally-sourced wine list, by sommelier Matt Dunne, highlights boutique and well-known labels.